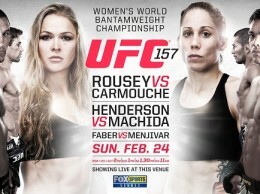 It appears as though Dan Henderson vs. Lyoto Machida is headed to UFC 157. According to sources close to the event, both Machida and Henderson have verbally agreed to meet on the Feb. 23 card at the Honda Center in Anaheim, Calif. No contracts have been signed just yet, though. Tatame.com first reported the news earlier this week. The fight isn’t expected to serve as the main event. UFC president Dana White told MMAFighting.com on Tuesday that he was “working on” that card’s headlining act.